This is a USA 120V AC model, sorry we do not have models for other voltages. In late 2012, there is a new version available, with advanced footswitch capability. The audio signal no longer goes to the footswitch, so the tone is improved. There is nothing funnier than the makers of this new wave of digital and chip-based delays claiming to "sound like a tape echo." One after another they pop out the same old digital and bucket-brigade delays with a few new bells and whistles that supposedly "emulate the warble and tape head saturation of a tape echo" ...Bull$#^%. That only flies with someone who has never played a good tape echo. For those of us who know and care, there's no substitute...so settle for an approximation if you must, there's nothing wrong with that...but please spare me the rhetoric. If you ask that then you have never played a healthy Echoplex! No delay (rackmount or pedal, analog or digital) can replicate the natural, warm, and shimmery tones of an old Echoplex. Unless you've experienced it you don't know what you're missing. Yeah, but they're noisy and unreliable! 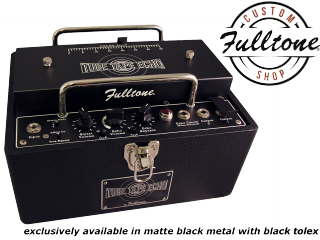 Yes, they certainly WERE....but the Fulltone TubeTapeEcho (TTE) is dead-quiet, and we've completely re-vamped both the electronics, the tape transport path, and even the tape cartridge itself to the point of near-overkill. The TTE produces less noise than most delay pedals. From a quick slapback to over 2 seconds. There is a top panel-mounted dual speed toggle switch to choose between: Hi-Speed and Lo-Speed operation. Hi-Speed gets you lots of Highs, less Bass, and a True Repeat without the Pitch variation of the old Echoplex. Lo-Speed is waaaaaaaaaaarrrrrrm, lots of Bass, less highs, and a slight "warble" that imparts a natural chorus effect made popular by people like Eric Johnson. Because they sound so good.....the enhancement to your basic tone is something you will not want to play without once you feel it, and you'll never again have to worry about signal loss due to long cables and too many pedals on your pedalboard. The big AC motors of yesteryear were noisy and inefficient so I replaced it with a servo-controlled hi-torque DC motor. Not only is this more quiet, but it is more stable and is 1/4 the size, allowing for a smaller overall housing as well. The TTE uses 2 x 12AX7 tubes (for the Record and Playback sections) with @200 volts DC and supply the filaments with 12 volts DC to reduce the hum further. The erase/ Bias section function uses one Electro Harmonix 12AT7. Handwired audio path, and world-famous Fulltone Made-in-USA Craftsmanship. No PCB-mounted Tubes or Jacks in this thing. Stereo outs! Yep, how many times have you longed for a slight slap or long bounce between 2 amps in the studio or on stage? But this ain't just stereo....there are 3 stereo modes. Better Tape Heads. The TTE has proprietary (custom-made) Erase, Record, and Playback heads that not only have better frequency response than the oldies, but are designed to last well into your retirement. Fulltone ETC-1 Tape cartridge...if you can't find it, make it yerself! The ETC-1 is loaded it with a vastly superior Mastering quality tape loop made with polyester backing and a higher bias Tape formulation. It will last for MONTHS because it's not cheap, used cart machine tape doused in graphite like the old Echoplex tapes. Note: Fulltone does not furnish tapes for Echoplex owners....they have enough tape to keep TTE owners happy for 20 years, but do not have enough to furnish the world's Echoplex owners. Sorry. Nickel Plated Stainless Steel Parts because I want the stuff I make to outlast you and me ...and look great. Echo Tone Control. The TTE has a very full-range/full-frequency Echo Sound.....but you can alter it to as vintage as you want a Tone control affecting only the repeats. Smaller. Old Echoplex EP-2 models have that cool little side compartment for storing stuff. I put that storage place into a Heavy duty (wood-reinforced) Cordura Nylon Gig-Bag. (included) This, along with some downsizing, due in part to the use of a DC motor, allows for a very compact, stout unit that can sit on your amp, in your pedalboard, or off to the side without taking up too much precious real estate. ETC-1 Tape cartridges are available ONLY to TTE owners. 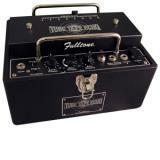 Buy them Direct in a"Two-Pack" from Fulltone after you buy this echo unit.